Hi there and welcome to the ScrappingClearly blog today!! Melinda here with you and I am sharing my first make not only for the month but for the year!! I hope the new year finds you well and ready for lots of scrappy inspiration from all of us here!! Kylie sent me the very awesome Pink Fresh Studio Boy's Fort collection and I couldn't wait to get stuck into it!! Here is my first page with the awesome collection and I am beyond happy with how it all came together! I have a process video available for this layout as well, just watch below!! To create my background I have started with Marshmallow cardstock paired with 3 different Distress Oxide Inks - Salty Ocean, Peacock Feathers and Faded Jeans - and the packaging technique; adding extra water when needed and drying off between coats. I love how the colours sit on top of each other without changing the colours - you can really see that in this close up of some splatters! I added some stamping using black archival ink and a couple of texture stamps randomly across where my mixed media was. I used papers "Wowsers", "Bold" and "Game On" to layer messily behind my photo adding extra dimension between my photo and the papers. Time to work on the title! The name of the collection reminded me of the photo I chose which in turn helped me to pick a title. I have built my title with the Boys Fort Mini Alpha Stickers and also some alphas from the Teresa Collins Signature Series which I have used some Fossilized Amber to colour - this colour is a great match with those mustard-y yellows in the collection! And enough room for a little journalling under the title! With the main part of my layout done I pulled out some embellishments and used some of the Printed Veneer Stickers (these are AWESOME! ), ephemera pieces and also some of the Phrase Stickers to embellish. My very final touch was some black splatters using my Roadbase Colour Spray by Colour Blast and some black marker outlining the big alphas in the word fort. With some of the shadows in the photo plus the journalling and the black phrase stickers I felt it was just what I needed to finish the page off. 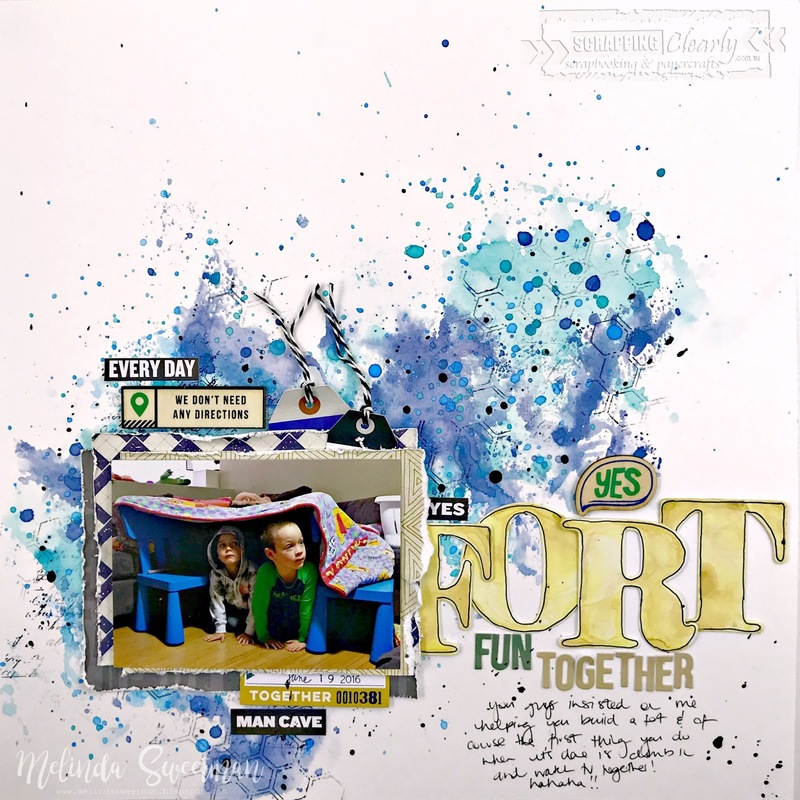 That's it for me for today but I will be back again sharing more "Boys Fort" inspiration!! I hope the start of your 2018 has been fab, I can't wait for some more play time! !